Chowders are generally thick soup that have been prepared with a roux and thinned down with stock, broth, milk or cream. Corn often being a common ingredient. Often seafood, preferably the shelled variety is added to a chowder. Served with salted crackers or bread rolls and butter it is a meal in itself. Having had a delicious cheese soup with corn the other day, I decided to come home and make my own. Here I share my version of a chowder; it is a cheese base that has been lightened with chicken broth and thinned down with whole milk. 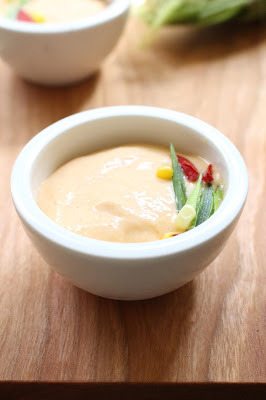 It is smooth and silky and the roasted corn kernels give it that extra pop of sweetness balancing out the hint of heat from the red pepper and mustard added to the soup. Its perfect to use up left over cheese and corn if you wish. In a large stock pot melt butter, add the flour, salt and mustard to make a roux. Add chicken stock and mix well until it is all smooth. Add the onions and garlic. Add your choice of pepper. Allow it to simmer for an hour. With an immersion blender smooth the liquid. Optionally strain it through a sieve. Continue to cook on a low flame start adding the cheese. Allow it to melt slowly. Pour in warm milk and finally the cream. Gently stir until it comes to a tepid warmth. Allow to simmer for 15 minutes and serve. Add more milk or cream to thin the chowder to desired consistency. Serve warm with a corn muffin or corn bread with butter. The smoothness and the colour of the chowder will depend on the cheese you add to this dish. While I personally do not enjoy processed cheese, non-grainy cheese like velveeta and cheez whizz with a dash of strong cheese like gruyere or comte` gives it a good texture and flavour. Deeper golden cheddar and jalapeno cheese also adds to the colour and flavour of this chowder. Using half and half instead of a combination of milk and cream is another option to consider. Alternately use whole milk. 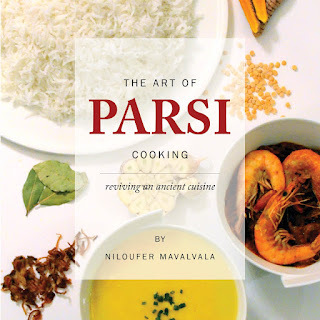 For recipes from the Parsi Food repertoire click The Art of Parsi Cooking;reviving an ancient cuisine.